The British Gazette » Brexit: A stay of execution? 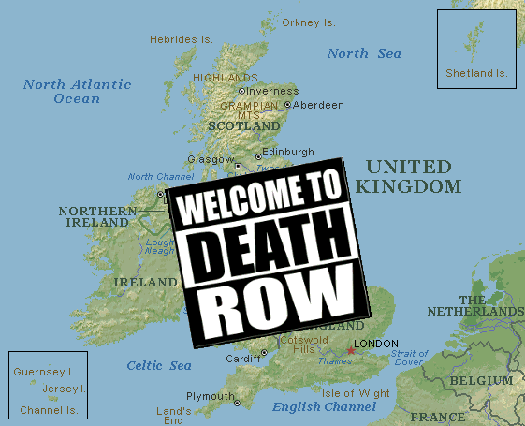 Whatever one’s views on the issue of the Death Penalty are, the situation that persists in the USA with hundreds of inmates kept for years on “Death Row” demonstrates beyond peradventure the difference between a sovereign nation state such as the United States of America and a semi-sovereign state such as the United Kingdom of Great Britain and Northern Ireland. The plain simple FACT of the matter is that there is NO WAY the UK would be allowed to carry on in the same manner as the USA. Now pedants may wish to point out that the issue of the Death Penalty is one linked to the European Convention of Human Rights and this is not part of the EU. This of course is correct. BUT – membership of the EU is CONDITIONAL on members accepting AND COMPLYING with the convention! Now of course, there are many British Gazette readers – these patriots now in advancing years – who have campaigned against the European Project for decades. These patriots, “saw this coming”. Now of course, there will be Remainiacs who will question this and state that these folk are a bit like the authors of Nostradamus books in that the sage’s predictions always appear in print AFTER the fact! But NO! These patriots could foresee this because of one simple FACT: Jean Monnet had openly written that a “United States of Europe” was the aim of the European Project! These patriotic folk did not have need of supernatural abilities or crystal balls. All they needed was the capacity to read a newspaper! Now, as they enter their later years these patriots have a glorious spectacle held before them: BREXIT! That at 11:00PM on Friday 29th March 2019, the UK will at last become a fully sovereign nation again. Of course, they see the danger of a Transition Treaty that would seek to delay this. Naturally, these patriots are dismayed and furious – and rightly so – at this statement. But here is an unpalatable FACT: The UK has no practical alternative but to accept! WHY? We hear these patriots shout! The best way of explaining this is an analogy. After all, whilst He was on Earth the Good Lord used this method of explanation a lot! Imagine Dear Reader that you are a newly appointed director to a limited company. You and lets us say, five other newly appointed directors have been appointed following an Extraordinary General Meeting called by the shareholders of this company who passed a motion of no confidence in the previous board of directors and as a result sacked them! The trouble was that the payments to the franchise were huge and were taking most of the profits. As a result, you and your five fellow directors are expected to negotiate the ending of the franchise and to re-establish the “good times” when the company provided it’s services under it’s own brand name; “Albion Haulage Contractors”. Unfortunately there is a problem. A BIG problem: the franchise agreement. This legal agreement contains an onerous PENALTY CLAUSE. It requires payments of TWICE the maximum annual franchise payment that was made over the entire period of the franchise for a period of TEN YEARS. Furthermore this payment is to be linked with inflation – as inflation goes up so does the payment – but if there is deflation the corollary does NOT apply! Furthermore, the payment is demanded in Euros and not Sterling so there is an added foreign currency risk involved! Not only that but a clause in the agreement FORBIDS the company from advertising under it’s own brand name or even informing it’s customers (as they are deemed to be customers of the franchise and NOT the company) of the company’s new position until AFTER the termination of the agreement! The problem is that the legal agreement is ENFORCABLE! The problem is that the grossly incompetent – or malevolent – former directors signed an absolutely awful agreement! But the FACT is that Albion Haulage Contractors Limited are bound by it’s terms! Thus you have the unpopular and unenviable task of having to tell these many angry shareholders these FACTS! Now let us skip back to reality and Madame Mayhem! What Madame is doing – either through ignorance or malevolence – is NOT to tell the People the FACTS! She is peddling a fantasy! Why? We don’t know! Your Editor is not a mind reader. He has no supernatural powers. The plain simple FACT of the matter is THIS: That Flexcit (EFTA + EEA) is, was and will be the ONLY practical doable Brexit strategy. This is because the UK MUST remain in the Single Market – aka Internal market – aka European Economic Area (EEA) – in order to preserve its economy intact! Furthermore, UNTIL the necessary infrastructure (customs posts and the supporting systems and staff) are in place – ON BOTH SIDES OF THE ENGLISH CHANNEL – remaining in the Custom’s Union – or a special agreement in place thereof – is essential! Now your Editor does not like this state of affairs any more than does Henry Bolton, UKIP’s leader. But your Editor at least accepts there is NO practical alternative! Thus, the indications that the UK will be forced to accept a most onerous Transition Treaty is at least a stay from the execution of the UK economy that is a “Hard Brexit”! Again, the learned Dr. North gives the world an excellent analysis of this dire situation!